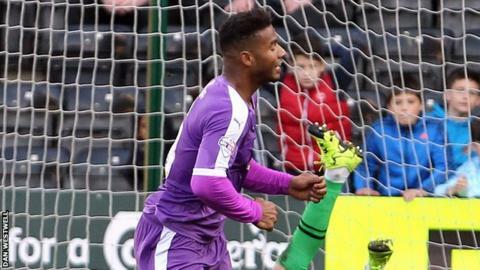 Plymouth Argyle manager Derek Adams says striker Reuben Reid's recent performances have been impressive. Reid, 27, scored both goals as Argyle beat Notts County 2-0 to return to the top of League Two on Sunday. "He's played really well and I said that to him at half-time. He was the one that was the shining lights for us and he took his goals really well," Adams told BBC Radio Devon. "He's unfortunate that he never got a hat-trick." Reid has now scored three goals in his last three games, having missed part of pre-season after undergoing foot surgery at the end of the last campaign. "Last week I thought he did really well and I thought today he was excellent," added Adams. "He's got a wee bit of power about him just now - he's quick, he's strong, he's a great finisher and we've got players in the team that find him."